As it’s December I am sharing with you in today’s post how we celebrate Christmas in Germany. Unlike in most English speaking countries we celebrate Christmas on the 24th of December which is Christmas Eve to you. In general this is what people tend to get up to on Christmas Eve or as we say Heiligabend. Shops tend to open until 12 noon or sometimes 2 pm depending on whether Heiligabend falls on a week day or not. It also means that many people also are still at work until midday. Often people still do a quick shop to buy ingredients for their Christmas dinner and sometimes even a tree if they didn’t manage to buy it earlier. In Cologne you can often buy your Christmas tree at a pub. My dad is spoilt for choice as he has two pubs where they sell trees. And when we are over for Christmas it’s my hubby’s and my job to get the tree. We also decorate the tree at Heiligabend together with my younger sister. Once the shopping has been sorted and the whole family is together, the cooking starts and at about 3pm or 4pm it’s time for coffee and cake and Christmas cookies. After coffee it’s time for singing some Christmas songs (I always dread this as we never know the lyrics and hubby often doesn’t know the songs) and then it’s time for “Bescherung” – exchanging and opening the Christmas gifts which have been carefully placed under the Christmas tree. 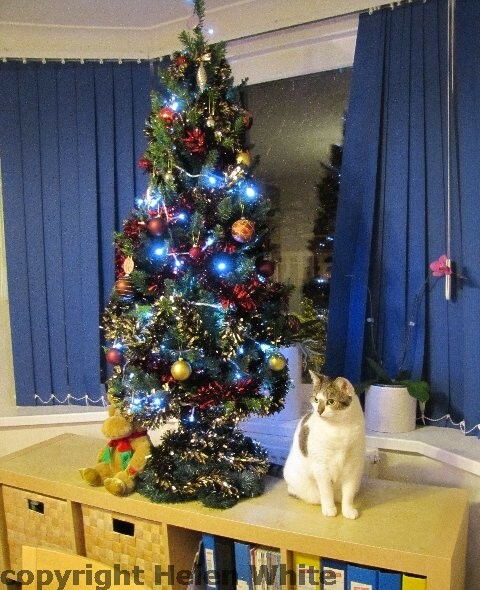 Our cat Bobby with a small fake Christmas tree. Currently I don’t have any other Christmassy images from Germany. And then it’s time to tend to the Christmas dinner. While it’s often turkey in the UK, in Germany we often eat a Christmas goose or Weihnachtsgans. In some families a meat fondue is also popular. My dad loves cooking and he tends to suggest what we could have for dinner – it’s always a three course meal and includes at least one fish dish. Last year we had mainly vegetarian food because my sister decided to go veggie. After dinner it’s chill out time – either in front of the telly or we play a board game or just start using our gifts. In religious households people also will attend the midnight mass. On the 25th and 26th Germans tend to either have friends and family around or are visiting friends and family. Consumerism isn’t as massive in Germany as over here in the UK – which means shops are closed until the 27th with the exception of a few Kiosks or corner shops. I grew up in a Catholic family and my grandparents were very devout. So the run up to Christmas (what we call the Adventszeit) was very important and an exciting time for us kids. For the first 9 years of my life I grew up with my aunt, who is 5 years older than me, and lived with my gran, who at the time insisted on us going to church (which I didn’t enjoy at all). But the advent time was very special, because we had a big advent calendar that my gran stuffed with surprises and we took it in turns each day to discover whatever was inside. My mum later kept this tradition going and bought two cute advent calendars that she would fill for me and my sister – even when I didn’t live there anymore – I would come home and find my advent calendar filled with small surprises. When my mum died my dad kept this tradition alive for my sister. The advent calendar wasn’t the only thing that I loved about Advent. My gran would spend the afternoons and evenings with us creating our own Christmas decorations with straw and foil and other craft materials. This was a great way to pass the time. We would listen to classical music and got stuck in. And every Advent Sunday we would light another candle on our Adventskranz (wreath). Heiligabend or just before Heiligabend my mum and my uncles and aunt and my cousins would arrive and we had a full house. I remember noise, chaos, a lot of singing, my uncle Thomas would also read the Christmas story from the Bible. And almost every Christmas there was a big argument (oh yes! ), but it would also always get resolved. I remember that my mum would send me off to bed during the afternoon- I guess so I wasn’t in the way and also so I was awake enough for the evening. Every member of the family had their own space on the dining room table which was filled with gifts and we each had our own decorated paper plate with sweets and baked Christmas cookies. So this is it – this is how we spend Christmas in Germany. I hope you enjoyed this post and found it insightful. Please feel free to comment below and share.